Brendan Foley is a bestselling author with two published books on success and a third book in the pipeline. As they say 'leaders are readers'. See links below to purchase the Yin Yang Complex or the 5 States of Success. 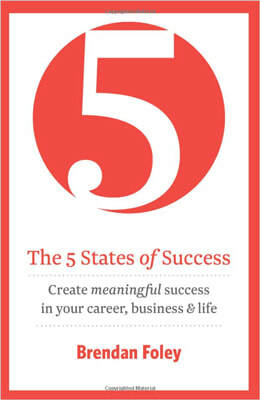 The 5 States of Success – create meaningful success in your career, business & life. #1 bestseller on Amazon.co.uk when launched. Brendan Foley has worked with 1000s of people and 100s of companies across all sectors to help to create meaningful success. Through working with highly successful business professionals across the globe he has identified the ‘5 States of Success’, insight, connection, certainty, vitality and spirit. When these states are entered into they produce; clarity, empathy, conviction, action and purpose, which are the essential ingredients of meaningful success. He has found that most successful people and businesses demonstrate these traits. Using clear examples, deep insights, the latest research, tools, techniques and practical exercises, the reader will learn how to enter these states to create meaningful success and happiness in business and life! The question you have to answer now is: are you prepared to create meaningful success in your business and your life? 5 States of Success Trailer from Brendan Foley on Vimeo. Do you ever wonder why you feel the way you do; why people act the way they do? If the answer is yes then what you are seeking to understand are the worlds oldest and most dynamic forces; masculine and feminine energy. All men and women possess a combination of both masculine (yang) and feminine (yin) energies. These two primary energies affect all aspects of our lives, including the levels of success and happiness that we achieve. The Yin Yang Complex reveals how balancing these masculine and feminine energies can help you to gain a new perspective on your life, your relationships, your career and your place in the world. It will take you on a journey of discovery that will provide you with insight into how to change your life. Filled with practical exercises and through proving questions the Yin Yang Complex is an essential for every personal development library. The Yin Yang Complex is available as a paperback and ebook on Kindle and other devices. Ken O’Brien, General Manager UK & Ireland, BioHorizons.